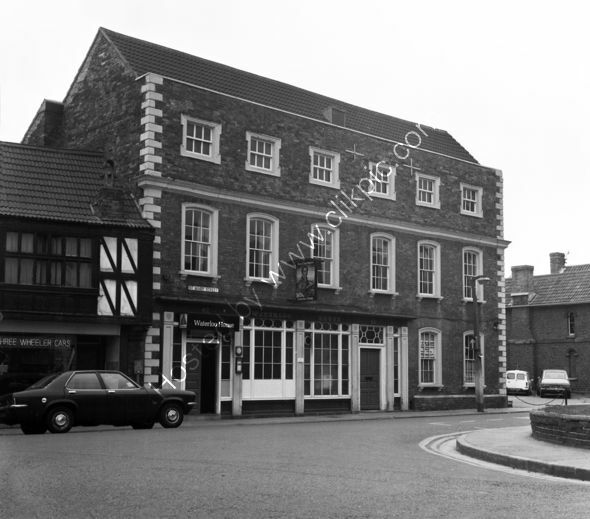 Waterloo House in 1973.Waterloo House in 1973, situated in St Mary Street, Bridgwater (later the Bridgwater Inn). Closed since 2010 it is hoped (Jan 2019) that it may re-open as a pub or hotel. Repointing or rebuilding of the gable end is evident and it appears that builders are in residence and have their board in the window advertising "C J Plenty General House Repairs, Bridgwater 4541.The property to the left (listed) is "Three Wheeler Cars" and has a Vauxhall Victor parked outside. The car on the far right is BAF 98K. For commercial use of this photo, including use on another website, please visit Alamy.com and search for RFFCBT. For a one-off print please see below.